Heh! 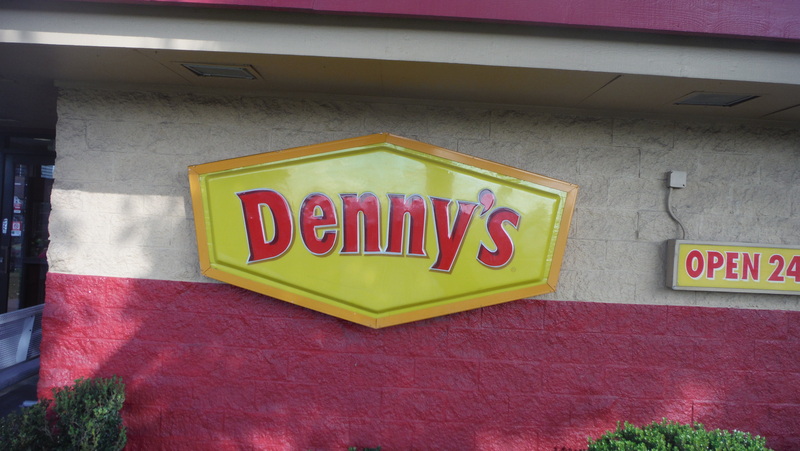 Any excuse to get out of the house and eat at Denny’s. My (beautiful) niece, Kristina Eckert, posted this picture on Facebook this morning. 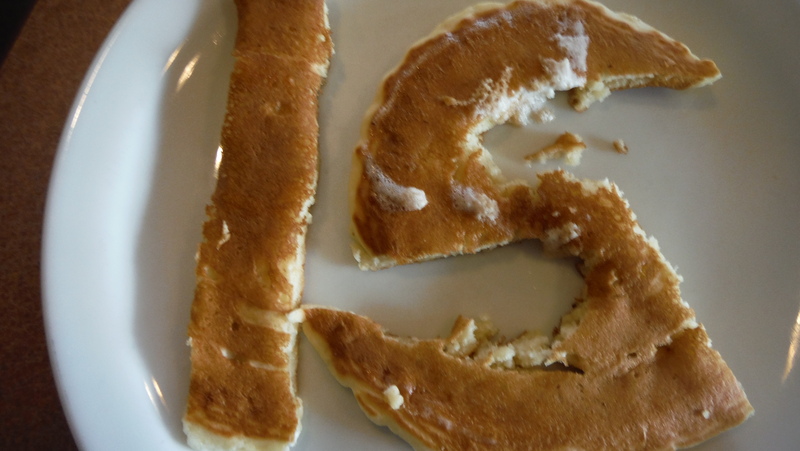 It inspired me to do my own version of “the year in pancakes”. Cookery and photography and cool idea on this first one all by Kristina. 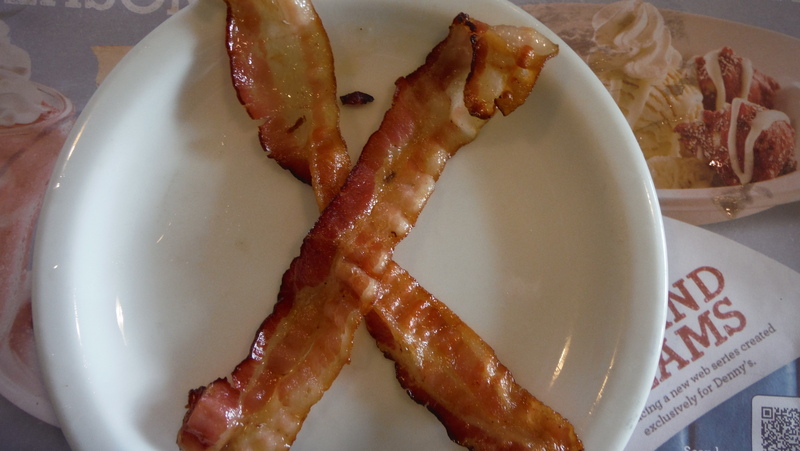 Kris actually cooked them in these shapes and got them all on one plate–something far beyond my artistic capability. 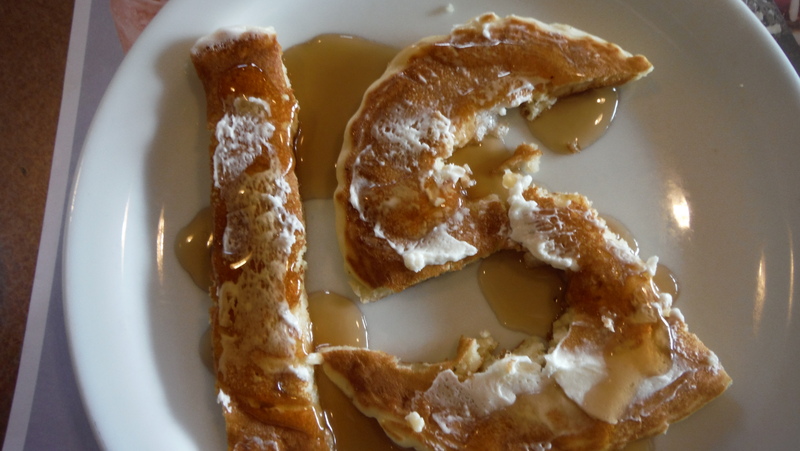 My first thought on seeing this pic on Facebook was that I’d have to eat the pancakes into shape if I did that. 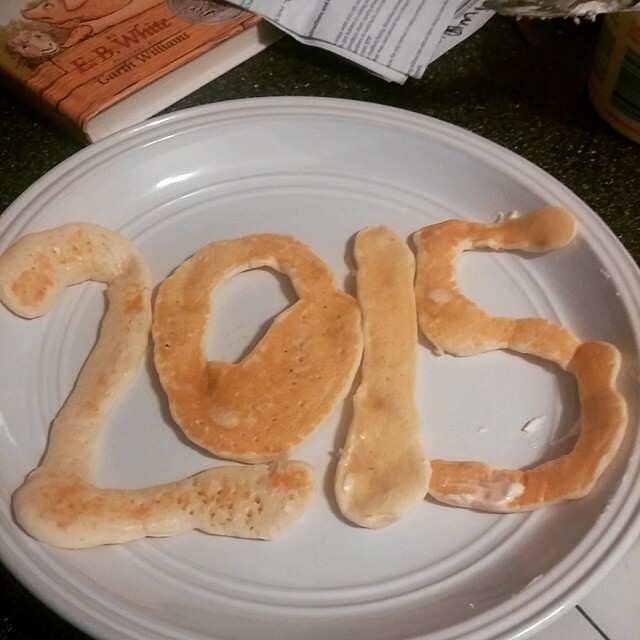 My second thought was: why shouldn’t I do my own version of the year in pancakes. It seemed like a good excuse to get out of the house this New Year’s Day morning (11 a.m. Arizona time). Since I pride myself on being a troll of action the following events were inevitable. The sky–the sun is breaking through the clouds left over from last night’s storm, and it was very bright and cold (for Arizona). The scene of the action. 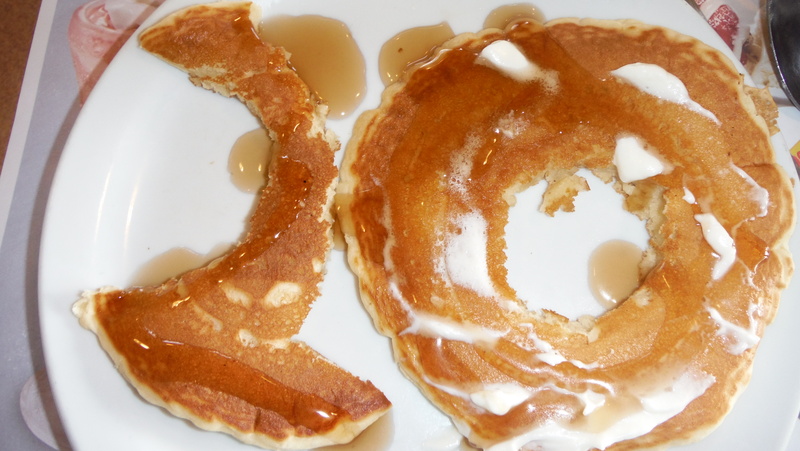 My version of the year in pancakes–shaped with spoon and fork, not baked into shape. and I ate them all up. This got me to thinking philosophically–a hazard of getting old. If the pancakes are the year (metaphorically), I did not make them. They came from a higher, larger source. 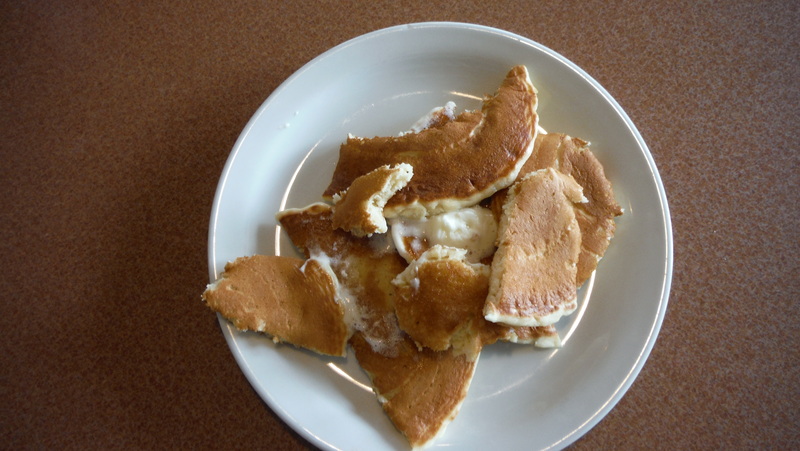 Denny’s Restaurant made the pancakes. God made the year. I did not cook the pancakes. They came ready to eat. I do not create time. It’s part of the universe I live in. 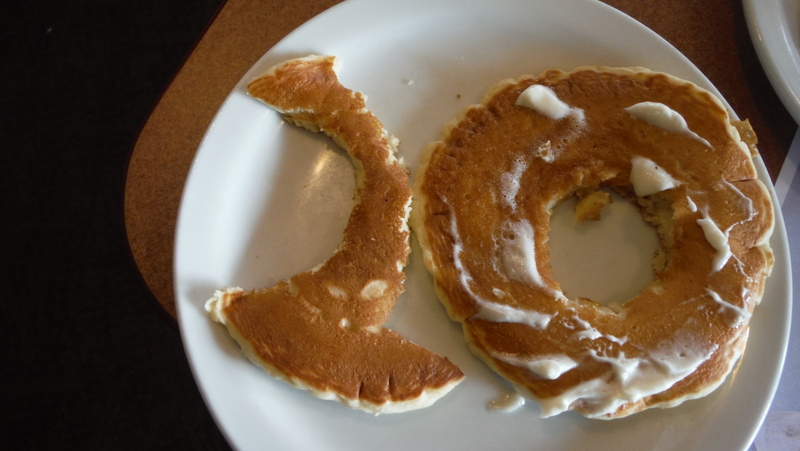 But I shaped those pancakes to my will (and I will do the same for the upcoming year). My shaping might not be particularly stylish or well-done, but it worked for me. 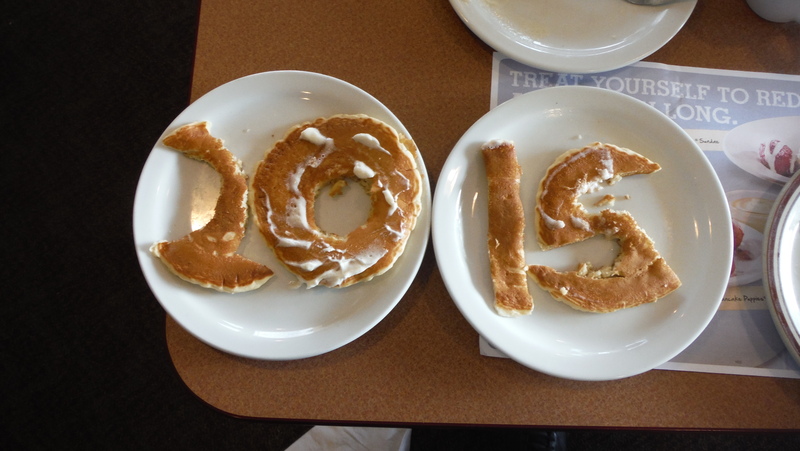 And I ate up those pancakes and enjoyed them–just as I expect to do for the upcoming year. 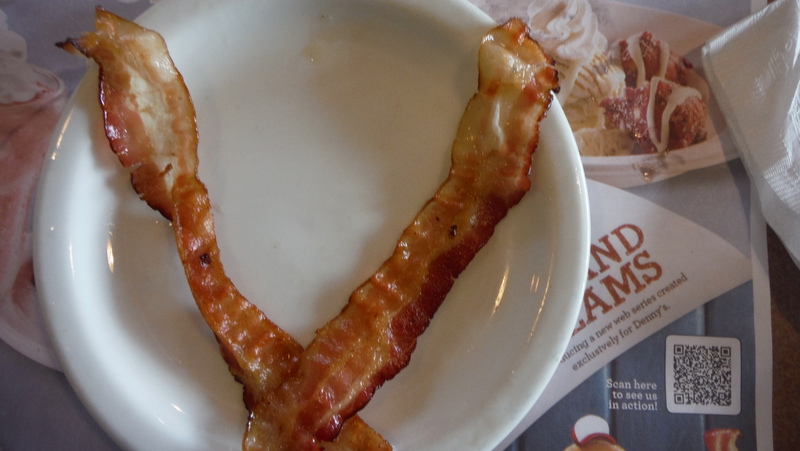 I wasn’t quite satisfied with a year that was just pancakes, so I ordered some bacon also. 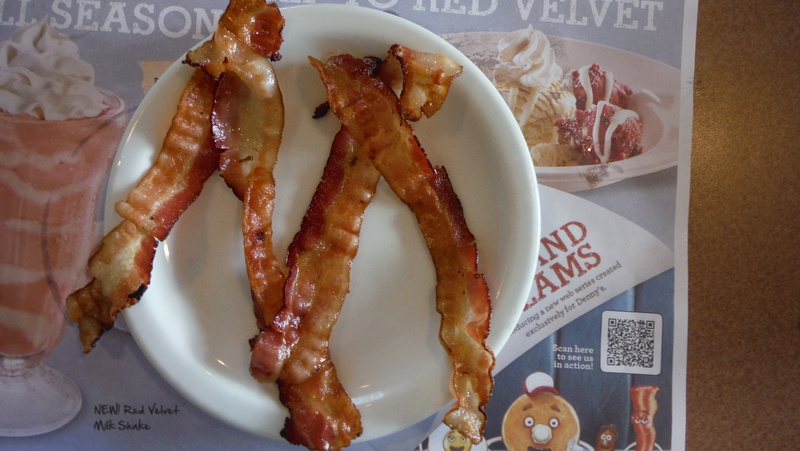 Bacon is a different medium–a lot harder to turn into a numeric representation of this year. But I found a way. My attempt to resize and edit these pix into a straight line failed, so you’ll have to read it Japanese style–top to bottom. Can you read it? MMXV. I ate that too. A year needs some meat in it. The adventure ends the same way it began–with a shot of the sky as I came out of Denny’s. 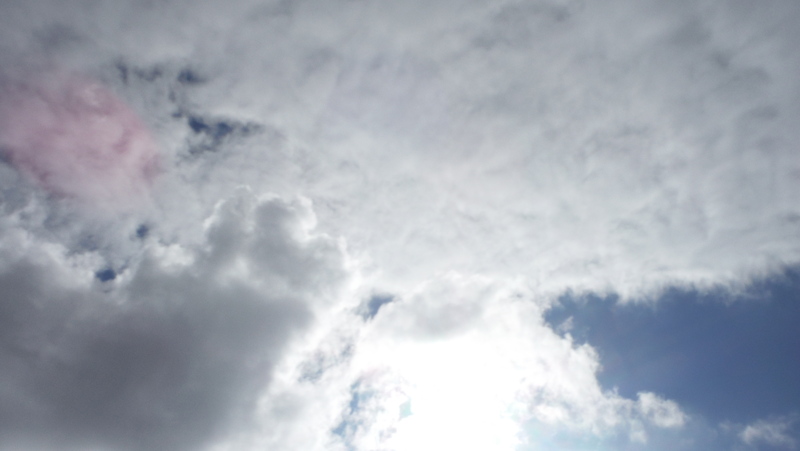 Since I’ve been thinking about the year to come all morning, I took this sky shot as an omen for the upcoming year. Read into it what you will. 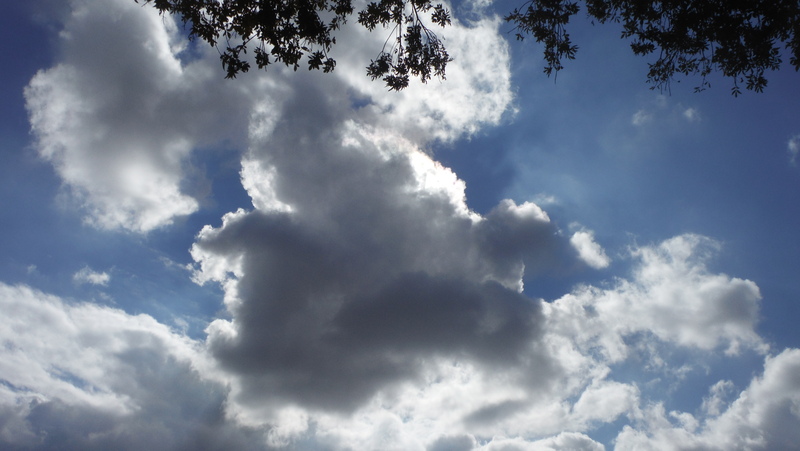 Sunshine and darkness, blue skies and cloudy–I guess we will see it all again in 2015. If you ever have fun playiing with your food, why not leave a comment?